So, I've discovered a way to get a person to climb up onto a ladder many weekends in a row, two stories up into the air, and painstakingly paint lots of 1/4" wood edges. In fact, it's incredibly simple. All it takes is your friendly local contractor to drop by and give you what turns out to be an outrageously expensive quote for painting the exterior of your 100+ year old home! Flash back to earlier this summer. While I should have been outside enjoying some peaceful relaxation in the sun (still slathered in sunscreen, mind you) I was instead getting more and more fed up with the flaking, who-knows-how-old paint job on all my window trim and the siding of the sun porch on the back of my house. When I moved in a few years back it was already starting to show some signs of sun damage and wear, but this year it had moved from something to deal with some other day to really just quite sad looking. It was time. After almost a month and half of weekends filled with painting, I've learned a thing or two about DIY-ing your exterior paint job. Lucky for you, I'm generous enough to share my knowledge! Don't underestimate the prep work. It might seem like the cleaning and scraping will only take a few hours, but believe me it won't. Even if you're only doing smaller things like window sills and not your whole house, the prep work can still easily take two days. Be thorough, don't rush it and do it right. You'll thank yourself later. Get more ladders than you can shake a stick at. Short ones, tall ones, medium ones. You'll need them all. Especially if you've got an older home with windows at "non-standard" locations and heights, you'll find yourself maneuvering in all kinds of ways to get to where you need to paint. Best to have a sturdy platform when you're dangling halfway up in the air! It's even better if you can get ladders with platforms for holding paint buckets. For extension ladders, try sticking a pole or dowel through wrung and put a little notch in it. Now you can use that to hang a paint can from while you keep both hands on your ladder! Choose quality paint. It might sting more when you're looking at the total at the register, but the better the paint, the fewer coats you'll need and the longer it lasts. 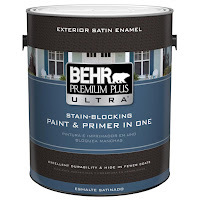 I can't say enough about the Behr Premium Plus Ultra. It goes on smoothly and covers with as little as a single coat. Good brushes make all the difference. I painted with all kinds of borrowed brushes this summer, but everyone that helped out was always fighting for the higher quality brushes. They don't leave as many streaks and the bristles don't fly all different directions after a few uses. Invest when you do your first paint job and if you clean them well they should last you a long time. My favorite brushes this summer were ones from Purdy. Look out for sales. Good paint and good brushes aren't cheap. I lucked out and purchased all my paint from Home Depot in mid-summer when they were doing a $10 off per gallon promotion. All-in-all I saved about $120! Custom color match if you can't find a premixed color. My local Home Depot paint department employees have basically been my heroes throughout this whole process. Not only are they very knowledgable about the paints themselves, but they're also willing to scrub a piece of dirty old brick until they can get just the right amount of space to scan for a color match. None of the made-to-look-like-brick colors matched my weirdly purply old bricks, but Ginger at Home Depot mixed up a match so perfect that I still can't quite tell where the sample she painted right onto the brick actually is.